I’m sure you’d agree with me that end-user training is usually an afterthought in most ERP projects. Why do you think it is so? This is because the ERP implementation partners only train the trainers and are very expensive, so the budget becomes unviable when it comes to end-user training. Many organizations do not have a specialized team to develop these training programs and might not know whom to approach. In such situations, there can be one solution! Wondering what’s that? E-learning development using rapid authoring tools! Yes, you’ve read it right. You can do it yourself without any knowledge of coding. Rapid authoring tools make the online ERP end-user training development process easy and cost effective with their built-in features. Not sure which tool to use? Wait, I think I know one such tool. It’s Articulate Storyline. In this blog, we will discover how Articulate Storyline addresses the WHAT, WHY, HOW and KNOW factors of ERP end-user training. The WHAT and WHY factors of ERP end-user training discuss what ERP is all about and the importance of its implementation and training. In online ERP end-user training, you can address this factor using an avatar which acts as a guide/instructor for the end-users. The avatar must relate to the end-users’ roles/ jobs and provide adequate motivation. 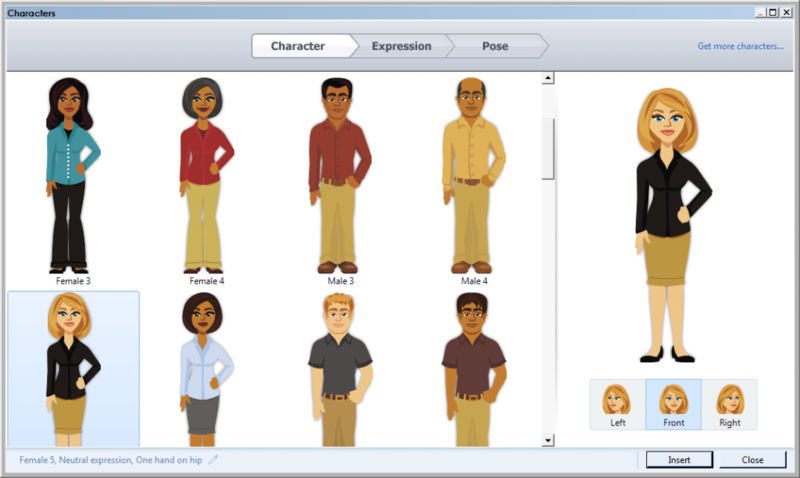 Articulate Storyline provides both illustrated and real avatars. These avatars are of different professions, races, and ages in various poses and expressions. They enable effective, quick development of guided e-learning programs to address the WHY factor in online ERP end-user training. 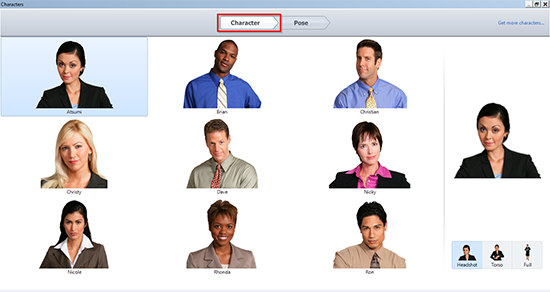 The screenshots given below display the various avatars Articulate Storyline provides. The HOW factor of ERP end-user training demonstrates how to perform the functions related to the end-users’ job roles. In online ERP end-user training, you can address this factor through software training simulations which provide end-users hands-on training experiences of the ERP system. Articulate Storyline makes the development of software simulations a matter of just a few clicks. You only have to capture the step by step procedure of the software and Articulate Storyline divides them into Watch, Try, and Do phases for you. 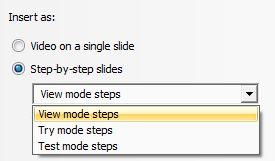 Also, you need not take the trouble of writing the instructions for each step; Articulate Storyline, by default provides instructions for each step in callouts. The screenshots below display the feature to record a screen and also the option to either use the screencast as a single video or break it down into step by step slides. It is important for every training manager to know how much end-users have learned the functions of the software. Formative and summative assessments help him assess this. Articulate Storyline provides different types of assessment slides with built-in functionalities. You only need to insert them in your project, add questions, options, specify the correct answer, and add the appropriate feedback. Also, Articulate Storyline provides a built-in Result slide. With such wonderful built-in features, developing assessments has never been so easy. 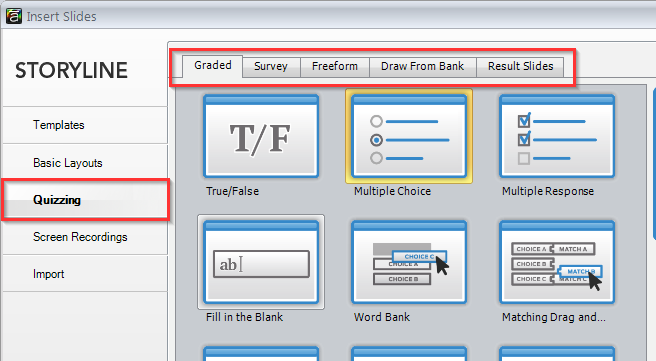 The screenshot below displays the various types of assessment slides available in Articulate Storyline. Articulate Storyline also provides built-in interactivity slides, slide layouts, basic animations, and much more to develop interactive and engaging ERP end-user e-learning programs. All you have to do is buy a licensed version of Articulate Storyline, record the functions of the software based on the roles of different end-users, publish the simulations, and upload it to your LMS or shake hands with a training partner who has the expertise in using the tool to develop effective online training programs. This is how Articulate Storyline helps you address all the factors – the What, Why, How, & Know of online ERP end-user training. Hope you find this post helpful. Please share your thoughts through your comments.